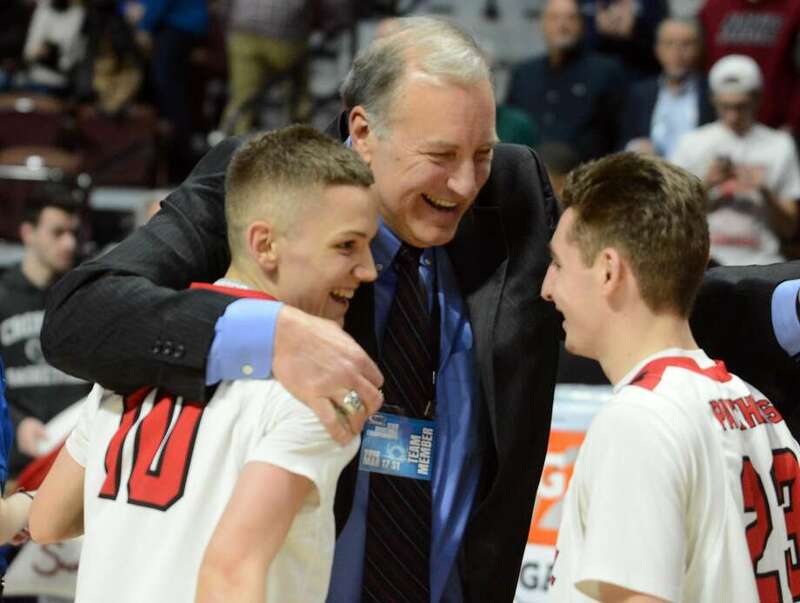 The Cromwell boys basketball team defeated Wamogo, 58-40 to win the 2018 CIAC Division V state championship at Mohegan Sun Arena in Uncasville on Saturday, March 17, 2018. Cromwell's Noah Budzik looks to shoot as Wamogo's Garrett Sattazahn defends during Saturday's Division V championship game in Uncasville. Members of the Cromwell boys basketball team celebrate with the championship plaque after their win in Saturday's Division V championship game in Uncasville. Cromwell’s Noah Budzik looks to shoot as Wamogo’s Garrett Sattazahn defends during Saturday's Division V championship game won by Cromwell in Uncasville. Tyler Thomas (22) of the Amity Spartans shoots a jumper during the state Division II Championship Game against the Immaculate Mustangs at Mohegan Sun Arena on Saturday March 17, 2018, in Montville, Connecticut. Amity’s John Nolan looks to gain position against Immaculate in the Division II championship game on Saturday. Immaculate’s Quinn Guth (10) shoots a jumper from the corner during the state Division II Championship Game against Amity at Mohegan Sun Arena on Saturday. UNCASVILLE – John Pinone cracked a smile Saturday afternoon. That’s a rarity when it comes to the 6-foot-8 long time coach of the Cromwell boys basketball team. He has high expectations for his club and demands plenty every time out. His Panthers have responded down the stretch, then one more time in the most important game of the season. Noah Budzi finished with a game-high 22 points to help lead No. 3 seed Cromwell to the Division V state championship, a 58-40 win over No. 4 Wamogo at the Mohegan Sun Arena. It’s the ninth state championship for the Panthers (23-4), tying them for fourth place all-time with Sacred Heart, which plays Notre Dame-Fairfield today in the Division I final. The two teams trail Hillhouse (24), Wilbur Cross (14) and St. Joseph (11). It’s the Shoreline Conference program’s first state title since 2009. Cromwell controlled the second half on both ends of the floor, running some long offensive possessions trying to get basket at the rim. The Panthers also stepped up on defense, holding Wamogo (22-5) to just 13 second-half points. Cromwell sbot over 60 percent (11 of 18) from the floor in the second half. Gabe Charleston finished with 10 points, eight rebounds and two blocks. He had seven rebounds and both blocks in the second half. The Panthers fell behind late in the second quarter and trailed 27-25 at halftime. But Cromwell roared back in the third, scoring the quarter’s first nine points. The Panthers ran long, deliberate possessions and made sure, more often than not, a shot would be from close range. Wamogo, the Berkshire League champion that eliminated Shoreline champion East Hampton in the semifinals, trailed by just four, 40-36, through three quarters. But the Panthers shut out the Warriors for the final 5:40 of the game. Garrett Sattazahn and Ethan Collins finished with 16 and 13 points, respectively, for Wamogo. Did Wampgo utilize a zone defense to control the temp? Congratulations to Cromwell a great group of young men and HANDS DOWN the best coaching staff and the shoreline week!!! Cromwell played very well. Budzick couldn’t be stopped, hit a couple deep 3’s. Garret Sattazahn had 16 points all in the paint! He was 0-5 from 3. Wamogo also took a huge blow when Reid Turtoro went down in the first quarter with apparent back spasms. Great game by Cromwell super proud of all the kids and happy to be back on top. Give all the credit in the world to the Wamogo kids. They walked into the gym and everybody laughed, put 5 undersized and wiry kids on the court and nobody ever game them any chance no matter who they were playing. These kids may not look it, but they can play. The Sattazahn kid is a hell of a player, hands down best in d5. He struggled with his shot all night but still fought hard and kept wamogo in the game through 3 quarters. The Turtoro kid showed some guts when he went down with a back injury just minutes into the game. He was clearly unfit to play and in immense pain, but he wouldn’t quit, going into the game for short bursts and hobbling his way around before dissapearing back into the locker room for a few minutes with the trainer. The Collins kid is only a sophomore and in two years will be exactly where Sattazahn is. Handles himself extremely well and is as tough as anybody around the basket. Congrats Cromwell on an amazing season and i look forward to watching wamogo at Mohegan again next season.